Wirt and Jackson counties experienced a silver rush in the late 1800s. Is there silver in the West Virginia hills? Was there ever? Western West Virginia enjoyed a kind of silver rush in the late 1800s, and a good number of prospectors opened mines, though then and now geologists say their efforts were for naught. The strata that underlies the valley of the Ohio River does not bear the ores in which silver is found. Despite that, three mining companies held leases in Jackson County in 1867 and another attempted to mine and smelt the precious metal in Wirt County. The Pomeroy Silver Mining Co., of Meigs County, Ohio, the Pittsburgh Exploring, Developing and Mining Co., of Pittsburgh, and the Point Pleasant Silver Mining and Exploring Co., of Point Pleasant, all leased Jackson County land, according to a report in the West Virginia Heritage Encyclopedia. The Point Pleasant concern boasted 16 stockholders, among who was a Professor William Eichoff, said to have determined that “large quantities of silver and gold” were present. 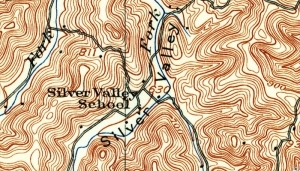 Silver Valley appears on a 1926 topographic map of Jackson County. In 1877, a shaft was sunk 500 feet on the Woodruff Farm on Mill Creek in Union District, and at about the same time another was sunk 350 feet on the Albert Shinn Farm on Cow Creek. The area around the latter is still known as Silver Valley, according to the report. Samples of silver ore were provided as evidence, but as no source was ever located, it’s been suggested that many of these finds were hoaxes. Coincidentally, a community named Silverton is located in Jackson County not far from Silver Valley, though Mike Ruben, executive director of the Ripley Convention and Visitors Bureau, points out that silver was not discovered in that community either, the name having been adopted from a surname. “It’s interesting that there’s both a Goldtown and a Silverton in Jackson County, but that neither gold nor silver have been found here,” Ruben said. It’s possible that the prospectors in Wirt and Jackson counties were induced by legends of silver lodes elsewhere in West Virginia. One such tale postulated that Captain Phillip Thurman discovered silver on Cannelton Mountain in northwestern Fayette County. Another held that Field Hudnall found silver in Rich Hollow on Kellys Creek in eastern Kanawha County. In 1927, J.H. Kidwell in the fictional book “Silver Fleece” wrote of an Indian who appeared in Alexandria, Va., in the 1760s wearing a silver necklace. The group of would-be prospectors he inspired traveled across western Virginia to Kentucky to discover mines, though, again, the book was fiction. Another more-involved tale concerned a silver mine alleged to have been operated by the Pence family near Meadow Bridge in southeastern Fayette County. According to the late historian Shirley Donnelly, the Pences discovered a lode and began minting the silver. “Quick to detect the value of their discovery and make use of the silver, it was alleged that the started a coinage system of their own. They minted their silver into the fashion of the current coinage of the realm. There was more silver in the coins struck by the Pence people than there was in the government issue of silver money,” Donnelley wrote. Prospectors might have also been inspired by tales of Swift’s “lost” silver mine, allegedly discovered in 1760 in eastern Kentucky, southwest Virginia or eastern Tennessee by an Englishman named Jonathan Swift. Some say the mine might have been located in southwestern West Virginia. According to the legend, Swift explored Kentucky prior to Daniel Boone, and was led by a wounded bear into a cave in which he discovered silver. He returned often to the cave to smelt bars and coins and buried part of his treasure nearby. He later walled the cave to prevent its discovery but was stricken blind and was never able to find it. Is there silver in West Virginia? According to the West Virginia Geologic Survey, no native silver has been recognized to date in West Virginia. Could a pirate’s treasure on the Ohio River be lost for good?